By day the Mad Chef serves dogs, burgers, street eats and exciting vegan options; by night there's live music, DJs, lots of craft beer and drink promos. This Bath Street institution has had a makeover and now boasts a shiny new gantry, lighting, DJ booth and sound system. Whether you visit on Kentucky Thursday, Dog Friday or T-Bone Sunday, you're guaranteed a bargain. The Mad Chef dishes up dogs, burgers and street eats, with spicy Irn-Bru sauce and Buckfast ice cream adding Scottish flare, and a genuine passion for exciting veggie and vegan cooking. The Not Dog, made with lentils, butternut squash and chickpeas topped with avocado cheese sauce, apricots and walnuts is an inspired mix of textures and flavours. A Vladimir Poutine with peppercorn sauce and cubes of Scottish cheddar is a decadent side that avoids the sloppiness common with poutine. With a great selection of canned craft beer, indulgent takes on classic cocktails and Prosecco on promo, as well as a programme of live music and club nights, Bloc+ has all the elements you'd expect from an institution. Come and try our 'Durty Burger': Grilled 6oz beef patty topped with Smiths bacon fries (yes, crisps), trailer trash cheese, homemade burger relish, sweet pickles and our burger gravy. Robust, smokey, gooey and most of all durty. 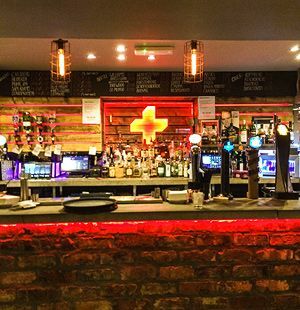 For those evenings when kicking-out time comes too soon, here we round up our favourite late-opening bars in Glasgow so you can carry on the fun into the wee small hours. From quirky vegan hangouts hosting sessions with local musicians to late night music bars with good food offerings, Glasgow has a whole range of restaurants and cafés playing live music at all hours. Looking for events in Glasgow?